(Toronto, December 2, 2008) One of the most distinctive architectural features of the Frank Gehry-designed Art Gallery of Ontario opens to the public this Thursday, December 4. The Douglas fir-clad sculptural staircase rises from the second floor of Walker Court, through the glass ceiling and extends to the fifth floor of the Vivian & David Campbell Centre for Contemporary Art. It was one of the last architectural elements to be completed in the $276 million transformation of the AGO. 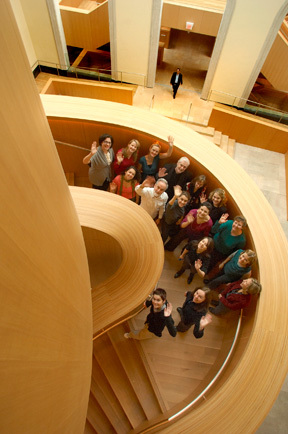 While more than 80,000 people have visited the new AGO since its series of pre-opening events began November 9, none have yet walked the entire length of the dramatically curving staircase, named for Allan Slaight and Emmanuelle Gattuso in recognition of their generous support of the Transformation AGO campaign. The campaign reached its goal on opening day, November 14. In designing the signature staircase, Gehry remarked that he hoped its warmth and intimacy would beckon visitors and become a place where people fall in love. While romance has yet to be kindled along its 138 steps, competition was, as visitors were invited to guess the number of steps while the staircase was still closed. Guesses ranged from zero (“it’s a slide, a magical slide,” wrote the entrant) to 1,900. The five winners are Elsa Macdonald, McKinley Duncan, Joseph Lui, Bev Biderman and Susan Curtis. All will receive a gift from Shop AGO. Be among the first to walk this already celebrated stairway to heaven. The AGO is open this Saturday and Sunday from 10 a.m. to 5:30 p.m. Admission is $18 for adults, $15 for seniors, $10 for students, $45 for a family of two and up to five children, and free for children ages five and under. Admission is always free on Wednesday nights 6-8:30 p.m.
With a permanent collection of more than 73,000 works of art, the Art Gallery of Ontario is among the most distinguished art museums in North America. The Gallery began an extraordinary chapter when it launched Transformation AGO in 2002. Multi-faceted in scope, Transformation AGO involves the unprecedented growth of the permanent collection, an innovative architectural expansion by world-renowned architect Frank Gehry, and the strengthening of the museum’s endowment resources. As the imaginative centre of the city, the transformed AGO dramatically enriches our visitors’ experiences and provides greater access to the full vibrancy of the art museum.